In July, I gave a talk on prototyping and remaking old technologies at DH2016 in Kraków, Poland. In that talk, titled “Designing for Difficulty,” I argued that we often privilege ease-of-use or neatness in how we design technologies and study the narratives surrounding them. Difficulty is not always ideal or desirable, but I argue that we should attend more carefully to who or what is ignored when we ignore or dismiss difficulty out of hand. Prototyping old technologies can help us design with difficulty and uncertainty in mind—to see where messiness does not get in the way of meaning but where it becomes, itself, meaningful. 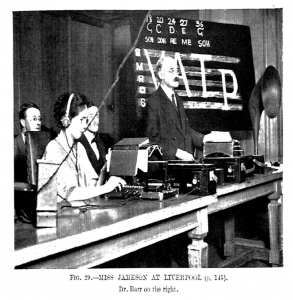 Consider the process of remaking an optophone, a reading aid for the blind developed and used during the 20th century (1910s-60s) that converted text into sound. Here, difficulty emerges in three ways: at the levels of 1) the archive, 2) trial-and-error remaking or rapid prototyping, and 3) interface design. But there are also cases where my schema differs from the diagrams found in historical documents. These differences could be a function of my word processor, or of a particular optophone illustrated by a historical diagram. But the more informative realization might be that such diagrams were probably, in one way or another, simplifications. To put it differently, historical sources (written or otherwise) are interpretations in and of themselves, subject to redaction, occlusion, or omission. Framed for particular audiences, they are imbued with values and biases that may only have emerged through past testing, use, and experimentation in the same way that they emerge through prototyping now. To prototype the tracer (the optophone mechanism that converted printed material into an electrical signal and then into sound) and simulate its behaviours, we’re using a Raspberry Pi and a camera similar to a laptop cam. However, there are aspects of the tracer that cannot be expressed through simulation. For example, operators of early optophones could select the pace and location of reading with a much higher degree of control than is possible with our current setup. They could scan the same spot repeatedly or move the handle to a different reading location at any point in the process. By contrast, the Raspberry Pi prototype (which is designed to scan discretely, character by character, instead of continuously) cannot account for this kind of fine-grained control or manual feedback. By this measure, it is, perhaps ironically, the newer technology that seems inefficient and inadequate. Exposing the limitations of current technologies in recreating past ones disputes the common assumption that innovation progresses teleologically or straightforwardly towards a brighter future. Moreover, we might ask what an appropriate technical goal or stopping point might be in terms of usability. One impulse might be to design and recreate an optophone where tones would be as easy to distinguish and interpret as possible. But this desire, to remake an ideal optophone, aligns with commercial attitudes towards technology that require devices to be rigorously optimized. By this logic, technologies are—and always should be—faster, cleaner, and easier to use than their predecessors; that is the stuff of progress. But such an optophone never existed, at least according to historical accounts. Historical sources suggest that Mary Jameson, after two hundred hours of practice, was able to read at a speed of one word per minute at a public demonstration. After years of practice, she was able to read sixty words per minute while most operators were able to read at a speed of around twenty words per minute. Using the optophone required an enormous amount of sustained practice, effort, and labour, which goes unrecognized except as a measure or proof of the optophone’s efficiency. 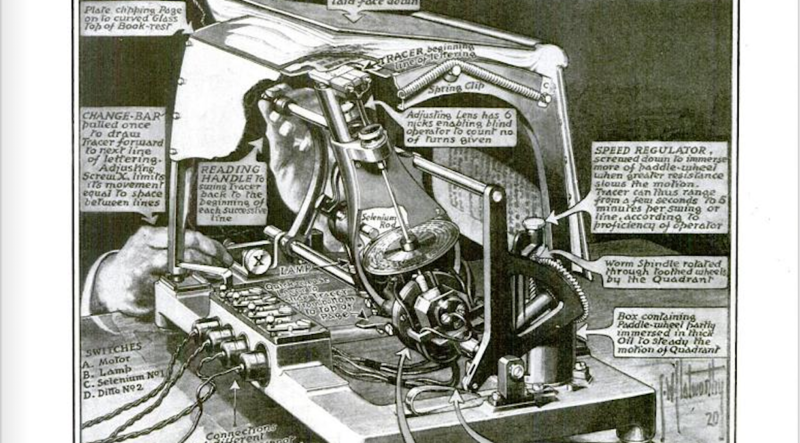 Moreover, sighted people concentrated on the conversion process itself (of text to sound), at the expense of the other processes involved in setting up and operating the optophone frame. For example, before an operator could even begin listening to tones, she or he would have to plug in the optophone, place the book on the frame and line up the tracer with the first line of type, and “tune” the optophone with a knob (presumably to the correct font height). Furthermore, certain design features of the optophone suggest that blind operators were able and expected to operate it independently, without help. For instance, the connectors (plugs) on the sides of the frame were different sizes so that they couldn’t be confused, and at least one knob had nicks to enable the operator to count how far it had turned. When prototyping or remaking, we are often faced with instances of limitation, frustration, absence, and surprise: aspects of history we cannot access or know for sure. Prototyping the past might be one way to approach such instances, not necessarily as a problem of technical ability or engineering—that is, not as a problem of tools or competence—but as a deeply cultural question, or even as a question of design. When and how might we want to communicate difficulty or labour? When might failure and frustration not be barriers to overcome, but rather ways to probe and understand the contexts that shape our limitations and how we came to understand them? We might also approach the question of absence or limitation as an ethical question, or a question of care. To consider prototyping as a way of doing history is to also consider how prototyping may challenge historical narratives by rewriting the record and attending to previously ignored figures such as Mary Jameson. Jameson (who the historical documentation only describes as a “user” or demonstrator, if it mentions her at all) played a central role in optophone development that is unrecognized in histories of the optophone and optical character recognition (OCR) today. Prototyping the optophone with Jameson in mind offers us a way to stress maintenance, development, and incremental change in contrast to masculine, “make or break” narratives of innovation and hyperbole. Asserting Jameson as a key developer in the history of OCR counters dominant myths about innovators: who they typically are and in what contexts innovation emerges. In fact, prototyping becomes a way to interrogate innovation itself, including, as in the case of the optophone, where it intersects with issues of gender and ability and their role in practice, both yesterday and today. Post by Tiffany Chan, attached to the KitsForCulture, with the physcomp and fabrication tags. Featured image care of Tiffany Chan. Thanks to Robert Baker (Blind Veterans UK), Mara Mills (New York University), and Matthew Rubery (Queen Mary University of London) for their support and feedback on this research. Research conducted with Katherine Goertz, Danielle Morgan, Victoria Murawski, and Jentery Sayers.